Leena Khamis, Kylie Ledbrook and Georgia Yeoman-Dale most recently played together at Macarthur Rams in the NSW NPL 1 competition. Yeoman-Dale is currently the leading goal scorer with 31 goals in that competition. 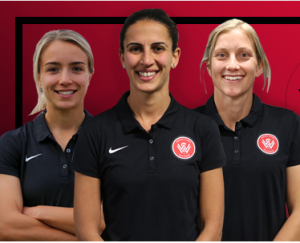 But these three superstars of the women’s game will soon be playing together in the W-League with Western Sydney Wanderers after the club announced it had signed them for the coming W-League season. The club says the trio bring a wealth of experience in the W-League. Minto-born Khamis will add firepower to the Wanderers front-third and is known for her determination and work rate, having played in every Westfield W-League match last season. Khamis has also featured in 25 matches for the Westfield Matildas, scoring five goals. The seasoned attacker said she was looking forward to getting to work with the Wanderers. “I’m actually really looking forward to it. It’s going to be a big challenge. Experienced midfielder Kylie Ledbrook comes to the Wanderers off the back of a fantastic Westfield W-league season that saw her get on the scoresheet six times. An extensive career has seen Ledbrook represent Australia in the U20 World Cup, the Olympic Games and the AFC Asian Cup in 2010. Capped 19-times by the Westfield Matildas, the experienced midfielder is excited by the challenge of representing the Red & Black this season. “I’m from the West, I grew up in Fairfield, and I’m really excited to work with Dan Barrett and the Wanderers this season,” said Ledbrook. Matilda Georgia Yeoman-Dale has been a constant threat in the Westfield W-League and has had experience playing for clubs such as Canberra United, Newcastle Jets and Sydney FC. Versatile, able to play as both right-back and attacking midfielder, Yeoman-Dale says she’s very excited to start a new chapter in her career with the Wanderers. “It’s the right move for me in my life right now and I’m excited,” said Yeoman-Dale. “I’m looking to have a season where I enjoy it and I’m playing good football constantly.